Pickens County is a county located in the north central portion of the U.S. state of Georgia. As of the 2010 census, the population was 29,431. The county seat is Jasper. Pickens County is part of the Atlanta-Sandy Springs-Roswell, GA Metropolitan Statistical Area. The Georgia General Assembly passed an act on December 5, 1853 to create Pickens County from portions of Cherokee and Gilmer counties. Pickens received several more land additions from Cherokee (1869) and Gilmer Counties (1858 and 1863); however several sections of Pickens County have also been transferred to other counties: Dawson County (1857), Gordon County (1860), and Cherokee County (1870). Pickens County is named for American Revolutionary War General Andrew Pickens. During the Civil War, Company D of the 1st Georgia Infantry Battalion of the Union Army was raised in Pickens County. Most of Pickens County’s early industry revolved around the marble industry. Georgia Marble Company is located in Marble Hill near Tate. The Tate Elementary school is built out of marble. The marble was also used to make the statue of Abraham Lincoln in the Lincoln Memorial. Most of the marble is white, but there is also very rare pink marble. It is one of the few places in the world where pink marble is found. The marble is also used for tombstones for the United States Military. Pickens County has seen very rapid growth with the building of Georgia State Route 515, locally referred to as the ‘4 lane’. Many new businesses and residents continue to move to Pickens County. Pickens County is home the Georgia Marble Festival. According to the U.S. Census Bureau, the county has a total area of 233 square miles (600 km2), of which 232 square miles (600 km2) is land and 0.7 square miles (1.8 km2) (0.3%) is water. The highest point in Pickens County is the 3,288 foot summit of Mount Oglethorpe, the southernmost peak in the Blue Ridge Mountains and, for a number of years, the southern terminus of the Appalachian Trail. Other notable peaks in Pickens County include Sharp Top Mountain and Sharp Mountain. One of the best viewpoints of Sharp Top Mountain is from Grandview Lake Dam on Grandview Road. 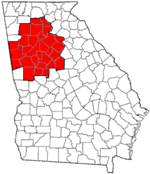 The eastern half of Pickens County is located in the Etowah River sub-basin of the ACT River Basin (Coosa-Tallapoosa River Basin). The western half of the county is located in the Coosawattee River sub-basin of the same larger ACT River Basin. Robert Jones is the chairman of the board of county commissioners; Jerry Barnes and Becky Denney serve as commissioners. As of the census of 2000, there were 22,983 people, 8,960 households, and 6,791 families residing in the county. The population density was 99 people per square mile (38/km²). There were 10,687 housing units at an average density of 46 per square mile (18/km²). The racial makeup of the county was 96.21% White, 1.27% Black or African American, 0.38% Native American, 0.23% Asian, 0.03% Pacific Islander, 1.04% from other races, and 0.84% from two or more races. 2.03% of the population were Hispanic or Latino of any race. There were 8,960 households out of which 31.10% had children under the age of 18 living with them, 63.50% were married couples living together, 8.80% had a female householder with no husband present, and 24.20% were non-families. 20.50% of all households were made up of individuals and 7.70% had someone living alone who was 65 years of age or older. The average household size was 2.54 and the average family size was 2.91. In the county, the population was spread out with 23.60% under the age of 18, 7.70% from 18 to 24, 29.80% from 25 to 44, 25.80% from 45 to 64, and 13.20% who were 65 years of age or older. The median age was 38 years. For every 100 females, there were 95.80 males. For every 100 females age 18 and over, there were 94.20 males. The median income for a household in the county was $41,387, and the median income for a family was $47,123. Males had a median income of $32,039 versus $22,866 for females. The per capita income for the county was $19,774. About 6.20% of families and 9.20% of the population were below the poverty line, including 13.20% of those under age 18 and 7.40% of those age 65 or over. As of the 2010 United States Census, there were 29,431 people, 11,291 households, and 8,423 families residing in the county. The population density was 126.8 inhabitants per square mile (49.0/km2). There were 13,692 housing units at an average density of 59.0 per square mile (22.8/km2). The racial makeup of the county was 95.7% white, 1.1% black or African American, 0.4% Asian, 0.3% American Indian, 1.3% from other races, and 1.2% from two or more races. Those of Hispanic or Latino origin made up 2.8% of the population. In terms of ancestry, 17.8% were American, 13.2% were English, 12.3% were Irish, and 10.0% were German. Of the 11,291 households, 32.1% had children under the age of 18 living with them, 60.7% were married couples living together, 9.9% had a female householder with no husband present, 25.4% were non-families, and 21.2% of all households were made up of individuals. The average household size was 2.57 and the average family size was 2.97. The median age was 42.1 years. The median income for a household in the county was $49,945 and the median income for a family was $59,955. Males had a median income of $46,773 versus $34,394 for females. The per capita income for the county was $25,892. About 8.9% of families and 11.6% of the population were below the poverty line, including 15.9% of those under age 18 and 11.4% of those age 65 or over. A significant portion of the county population resides in these three communities. These are large, gated private communities that function similar to a municipality providing many municipal-type services that operate independently of county government. ^ a b “State & County QuickFacts”. United States Census Bureau. Archived from the original on July 16, 2011. Retrieved February 18, 2014. ^ “Pickens County”. Retrieved June 28, 2014. ^ “Georgia Soil and Water Conservation Commission Interactive Mapping Experience”. Georgia Soil and Water Conservation Commission. Retrieved 2015-11-19. ^ Leip, David. “Dave Leip’s Atlas of U.S. Presidential Elections”. uselectionatlas.org. Retrieved 2018-03-22. ^ “U.S. Decennial Census”. United States Census Bureau. Retrieved June 25, 2014. ^ “Historical Census Browser”. University of Virginia Library. Retrieved June 25, 2014. ^ “Population of Counties by Decennial Census: 1900 to 1990”. United States Census Bureau. Retrieved June 25, 2014. ^ “Census 2000 PHC-T-4. Ranking Tables for Counties: 1990 and 2000” (PDF). United States Census Bureau. Retrieved June 25, 2014.